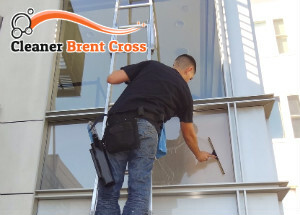 We have been providing professional window cleaning to the residents of Brent Cross NW4 for many years and offer outstanding services. Our staff are well trained, supplied with all kinds of equipment for reaching high buildings. We offer excellent window cleaning suitable to be used in houses, flats, offices, residential blocks, restaurants and schools. Our methods for sanitising are safe, efficient and guarantee perfectly washed glasses and frames. Contact us any time to order the cleaning of the windows in your estate. We will carry out the necessary work at a preferred by the customer day and time. Each of these methods for sanitising are highly effective and implemented following the Health and Safety guidelines. The reach and wash system which we apply is implemented for cleaning windows high up to 80 feet from the ground. Our operatives use water fed poles that are connected to vans which supply them with purified water. The water is being pumped up through the poles under low pressure in jets which rinse the glasses while soft brushes remove stains and grime. This method for cleaning uses only purified water after which the glasses and frames are left to dry and there are no streaks on them. 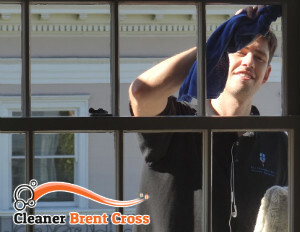 Contact us by phone, e-mail or online to order the window cleaning which we provide in Brent Cross and your property will have perfectly washed windows. Our employees can use cradles and hydraulic platforms to clean windows. These devices are preliminary testes and checked for safely functioning. Our operatives are trained to use different types of cradles and platforms. We offer cherry pickers for long and short term hiring. Our operatives are trained to work with ropes when platforms and cradles aren’t available or recommended. They choose the most appropriate cleaning method after accessing the risks for each building. Use our affordable window cleaning services, available in NW4 every day.